Private Edwin Stephenson poses with some boys at Vladivostok in 1919. 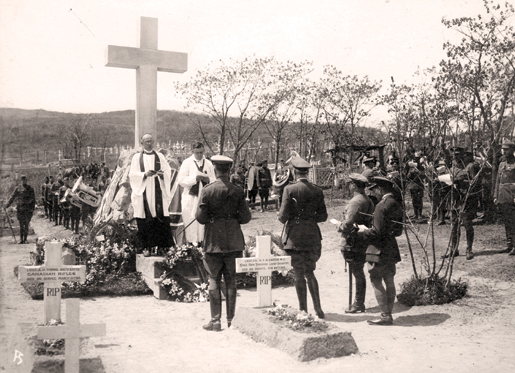 On a wooded hillside outside Vladivostok, Russia, 14 Canadians found their final resting place in 1919. Five others died at sea. They were ordinary folk who had enlisted in the closing days of the First World War for service in an unlikely theatre—Siberia. The Canadian Siberian Expedition Force (CSEF), which consisted of 4,213 men and one woman from across Canada, mobilized alongside 13 Allied armies to replace Lenin’s Bolsheviks with a more friendly government. The mission failed in the face of divided Allied strategies and heated domestic opposition, consigning the story to the margins of history. Editor’s note: University of Victoria historian Benjamin Isitt travelled across Russia in spring 2008, uncovering the forgotten history of Canada’s 1918-19 Siberian Expedition. Below is a taste of what he learned from that journey and from other research. 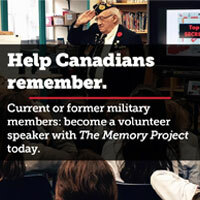 Canada sent soldiers to Siberia after social revolution removed Russia from the First World War. Revealing the interaction of military strategy, diplomacy, economics and ideology, Canada’s aims shifted from beginning to end. Russia had been a steadfast ally of both Canada and Britain, but the overthrow of the 300-year-old Romanov dynasty in March 1917 led to troop desertions on the Eastern Front. The Bolshevik seizure of power in November 1917 cemented the new alignments, culminating in a separate peace between Russia and Germany at Brest-Litovsk. Canada and the Allies refused to recognize the new Russian government, which the press described as “the enthronement of anarchy at Petrograd.” The Bolsheviks abolished private property, nationalized Russian banks, and repudiated 13 billion rubles in Allied war loans to the Czar. The Canadian Memorial at Marine Cemetery, Vladivostok, is dedicated in June 1919. As pockets of resistance emerged among Cossacks on the Don River and an array of White Russian generals from Northern Russia to Vladivostok—the Allies decided to send arms and men. White Russians was the name given to supporters of the counter-revolutionary armies that fought against the Bolshevik Red Army in the civil war. In December 1917, the Allied Supreme War Council pledged support to Russian forces that were committed to a continuation of war against Germany. In Vladivostok, 650,000 tons of Allied war materials were stockpiled on the wharves, stranded by supply problems along the Trans-Siberian Railroad. A Bolshevik administration took power, led by a 24-year-old university student named Konstantin Sukhanov, backed by a majority on the local soviet, a council of workers, soldiers’ and sailors’ deputies. As workers began seizing Vladivostok factories and the military port, Allied diplomats and businessmen grew alarmed. Others eyed Siberia’s abundant resources and markets, vacated by the German-owned Kunst & Albers Company, an organization akin to the Hudson’s Bay Co. “This is a wonderful chance for Canada,” Canadian intelligence officer James Mackintosh Bell informed the prime minister. Japan was the first foreign power to reach the Russian Far East when the naval cruisers Iwami and Asahi dropped anchor in Vladivostok’s Golden Horn Bay in January 1918. The British cruiser HMS Suffolk reached the port two days later. Japan, which had been spared from the carnage on the Western Front and an ally since 1914, was the only nation with the capacity to mount a large-scale intervention. However, other allies such as the United States and its president Woodrow Wilson were wary of Japanese territorial ambitions. Vladivostok relied on a vital communications link with European Russia: the Trans-Siberian Railroad and its Manchurian branch, the Chinese Eastern Railway zone that Russia leased from China. At the end of 1917, Chinese troops occupied the railway zone, disarming pro-Bolshevik Russians and backing an ad hoc government formed by railroad manager General Dmitri Horvath. He formed the nucleus of anti-Bolshevik power in the Russian Far East. Canadian gunners pose with two female Russian transport drivers, February 1919. In May 1918, the Trans-Siberian Railroad came under the control of the Czecho-Slovak Legion, a peculiar military force that had been marooned by the revolution. Consisting of 66,000 former prisoners of war, the Czecho-Slovaks clashed with the Red Army and seized a 6,000-kilometre stretch of railroad from the Ural Mountains to Vladivostok. This “army without a country” formed the advance party of Allied intervention, fighting Bolsheviks in a desperate bid for statehood. On June 28, 1918, the Czecho-Slovaks spearheaded the Allied seizure of Vladivostok. Japanese, British, American and Chinese marines landed from warships in Golden Horn Bay, seizing the railroad station, the powder magazine, and other strategic points. The Czechs toppled the local Soviet, arresting Sukhanov and killing 44 armed longshore workers holed up in the Red Staff building. A funeral attended by 20,000 Vladivostok citizens took place as the Allies placed the city under their “temporary protection.” By the end of July, all administrative, judicial, and financial functions had been assumed by the White cabinet of General Horvath. Vladivostok came under White administration as the Allies ironed out details for the Siberian Expedition. At meetings in London in July 1918, Canadian prime minister Sir Robert Borden and other leaders pledged contingents for Siberia. They also sent troops to Murmansk, Archangelsk, and the Caspian Sea, as part of a campaign to surround the Bolshevik regime on four fronts. On Aug. 12, 1918, the Privy Council approved the formation of the Canadian Siberian Expedition Force (CSEF), consisting of 4,000 troops in two infantry battalions, a machine-gun company, a mounted squadron from the Royal North West Mounted Police (RNWMP), and supporting units. In a diplomatic coup for Canada, 1,500 British troops in the Middlesex and Hampshire regiments were placed under the command of Canadian Major-General James H. Elmsley. 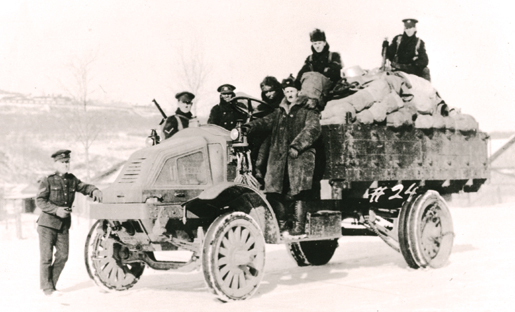 A loaded transport truck provides a photo op for members of the Canadian Siberian Expedition Force, May 1919. Victoria, B.C., was selected as the assembly point for the Siberian Expedition, with other camps established at New Westminster and Coquitlam. Conscripts and volunteers mobilized to the West Coast. The 259th Battalion (Canadian Rifles) came from military districts around Quebec City, Montreal, Kingston, Ont., Toronto, and London, Ont. ; the 260th Bn. from Nova Scotia, Manitoba, Alberta, and B.C., and the RNWMP’s B Squadron from Regina. Elmsley returned from Europe, where he had led the 8th Canadian Infantry Brigade on the Western Front, as officials arranged for the shipment of 3,000,000 rounds of ammunition from Vancouver to Vladivostok. The troops converged on Victoria’s Willows Camp, in the tiny municipality of Oak Bay, just as the Spanish flu hit, relayed west on the troop trains of the Siberian force. The 259th Bn. dropped 75 soldiers en route to the West Coast. When influenza was detected among soldiers at the Willows, the force was placed under quarantine and Victoria’s health committee banned all public gatherings. Such conditions sapped morale within Canada’s Siberian force, which consisted of 1,653 conscripts under the Military Service Act. War diaries record a range of disciplinary infractions, from desertions and insubordination to absence without leave. Morale was also strained by the presence of 135 Russian troops, recalled from France and attached to the CSEF to act as interpreters in Siberia. Before the troops left Victoria, “Bolshevik loyalties” were detected among the Russians and only 35 were deemed suitable for service. 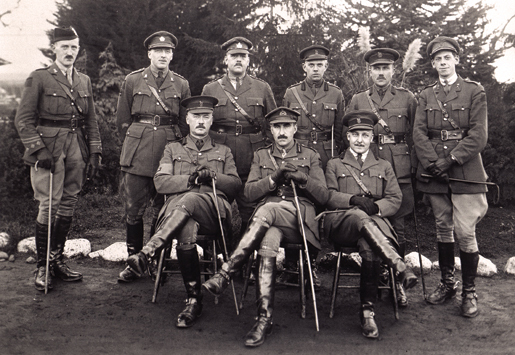 Officers of the 16th Infantry Brigade headquarters at Willows Camp, Victoria, December 1918. Oct. 11, 1918, Canada’s advance party sailed from Vancouver aboard the Empress of Japan, reaching Vladivostok 15 days later. The party consisted of 680 troops led by Elmsley and included civilians, such as Constantin Just, Canada’s former trade commissioner to Petrograd who belonged to the new Canadian Siberian Economic Commission. The Canadians were quartered in former Czarist barracks at the head of Golden Horn Bay and established force headquarters in the Pushkinskaya Theatre, an ornate building that had housed the esteemed Vladivostok Cultural-Education Society (to the anger of local business people). Kolchak consolidated power in Siberia as the Armistice ended fighting on the Western Front and Canadian labour and farm organizations turned public opinion against the Siberian Expedition. The Canadian government was ill-equipped to adapt to the changing conditions, as the prime minister had left Canada for peace talks in Europe. 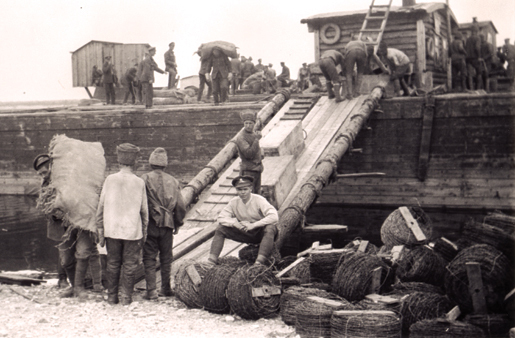 A Canadian gunner (seated) supervises prisoners as they load a barge at Yemetskoe, Northern Russia, in May 1919. Unrest mounted among labour unions in Canada’s four largest cities—Montreal, Toronto, Winnipeg and Vancouver—and among farm organization such as the United Farmers of Ontario and Mount Hope Grain Growers. All passed resolutions opposing the Siberian Expedition. Newspapers, including the Toronto Globe and Hamilton Spectator questioned the deployment of the force now that the war in Europe was over. In Victoria, during day-leave from camp, soldiers from the Siberian force attended labour meetings in large numbers where speakers voiced the demand “Hands Off Russia” and sold pro-Bolshevik pamphlets. “We are going to be railroaded to Siberia,” one soldier wrote to his sister from the Willows Camp. On Dec. 21, 1918, this unrest provoked a mutiny in the streets of Victoria, when two companies of French-Canadian soldiers in the 259th Bn. broke from a march between the camp and the troopship SS Teesta. Officers ordered the obedient men to remove their belts and whip the dissenters into line. The march proceeded at the point of the bayonet and early on the morning of Dec. 22, the Teesta sailed for Vladivostok. The main body of Canada’s Siberian Expedition reached Vladivostok in January 1919 just as the Canadian government decided to bring the troops home from Vladivostok. Owing to divisions among the Allies, and farmer and labour opposition on the home front, Canada refused to allow the troops to move “up country” to the active front against the Red Army. Growing logistical problems further undermined the intervention, as Bolsheviks and partisans waged an irregular guerilla assault on the Allies’ line of communication, the Trans-Siberian Railroad, and by blowing up bridges and seizing towns along the track. An army had been mobilized to Siberia, but it never received authorization to fight. Only 55 Canadians proceeded to Omsk, capital of Kolchak’s White Russian government, where they served as headquarters staff for British troops under the Canadian command. Another 200 Canadian soldiers joined Japanese, Czecho-Slovak, Italian and Chinese troops in an operation at the village of Shkotovo, just north of Vladivostok, to repel a partisan advance that threatened the coal supply for the railroad and Vladivostok. Members of the CSEF battle it out in a tug-of-war at Vladivostok in early 1919. The Canadians in Vladivostok, numbering 4,000 men and quartered at barracks outside the city at Second River and Gornostai Bay, performed garrison duty and tried to keep busy. Hockey, soccer and baseball leagues were established, along with two brigade newspapers, the Siberian Bugle and Siberian Sapper, and movie theatres and canteen huts. Soldiers took day-leave in the city centre, visiting the bustling Chinese bazaar, Russian baths, and brothels in the vice-filled port. As tension mounted in spring 1919, the Canadian command forbade contact with the civilian population and instructed soldiers to carry arms at all times. The evacuation of Vladivostok began in April 1919, as partisans laid siege to the city, killing Allied and White Russian officers and vandalizing vehicles and supplies. The Canadians dedicated a monument to the 19 Canadian war dead on June 1st, at the pretty Marine Cemetery on the hilly Churkin peninsula overlooking the sea. Four days later, on June 5, 1919, Elmsley and the remaining Canadians boarded the SS Monteagle and sailed for Victoria. Vladivostok’s White administration was toppled by Red partisans seven months later. While Japanese forces lingered in Siberia, Soviet power endured for the next 70 years. From a military standpoint, Canada’s Siberian Expedition—its first foray as a world power and first operation in the Far East—was a failure. Canada’s military commanders had anticipated this outcome before the main body of the force left Victoria. The chief of defence staff had warned that logistics lacked “co-ordination and control,” that the Trans-Siberian Railroad was “seriously disorganized,” and that there was “no general agreement” among the Allies.